Can brick-and-mortar stores still thrive? 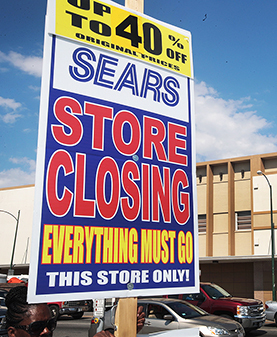 Store closings and bankruptcies continue at a blistering pace as many debt-laden retailers struggle to adapt to a rapidly expanding world of online commerce. Yet, the upheaval masks the retailing industry's surprising strengths. U.S. retail sales totaled a record $5.7 trillion in 2017, and this year's business looks to be similarly robust. The explosive popularity of internet shopping is forcing traditional retailers to find new ways to lure tech-savvy customers. Some stores are functioning more as product showrooms and others as “experiential” venues designed to attract shoppers with such offerings as cooking classes, quirky mattress-testing settings and computer-simulated wardrobe fittings. But the industry still has a glut of stores. Chains such as Sears and Walgreens/Rite Aid are closing hundreds of stores, and Toys R Us, among others, is going under. Traditional retailers also face stiff competition from Amazon and other online retailers, some of which are opening physical stores — an acknowledgment that most Americans, however wedded to technology, still prefer to shop in person.